As you know, I sometimes worry aloud about my profession. Beset by financial pressures in a bewildering new digital world and waging a fevered, desperate battle to keep readers and attract new ones, journalism seems to be cheapening itself. Thus, I was delighted to discover that there is an organization that could prevent this from happening: the Online News Association. An industry watchdog! In my hand is a report from the ONA’s recent national convention in Boston. I am broadly summarizing, but near as I can tell, the main message given to the conferees was that, journalistically, to attract reader eyeballs, you want to publish more pictures of bacon taped to cats. Give readers what they want, whatever it is. This point was driven home by the convention’s keynote speaker, Bob Woodward. Oh, wait. My mistake. Bob probably wasn’t available. The actual keynote speaker at the Online News Association convention was Ben Huh, that fearless charioteer leading new journalism into its bold future. 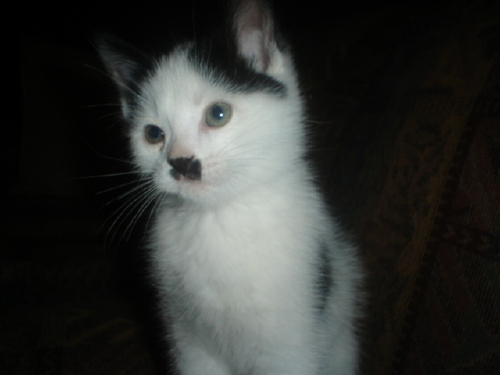 Keynoter Ben — whose résumé emphasizes he is a “journalism graduate” — got rich and influential as CEO of “I Can Has Cheezburger?” a Web site featuring goofy pictures of readers’ cats. Every time I write despairingly about what’s happening to my profession, there erupts an online clatter from younger journalists who contend I am a dyspeptic old codger resisting necessary and healthful change. This happened most recently in June, after I had criticized “branding,” the new industry theology in which reporters are encouraged to brazenly promote themselves. I thought branding — a concept adopted from marketing — was not only unseemly but carries a whiff of desperation, a symptom of an industry in panic, willing to abandon core principles, trying anything and everything in the hope that something, somewhere, can turn a profit. Anyway, that was four months ago. The big headline from the ONA’s convention in September was: BRANDING IS DEAD. Yep. Branding is so passé, so summer 2011! Deader than a doornail. Deader than the sycamores on which some newspapers still quaintly inscribe themselves. Branding has been replaced by a new theology in which — this is complicated, but I think I have this right — you, the journalist, don’t actually exist. You are a composite of all the people who read you — with their desires channeled through you and satisfied by you and them together, working in tandem. You are them but not them, and they are you but not you, in a mystical nexus not unlike the Holy Trinity. 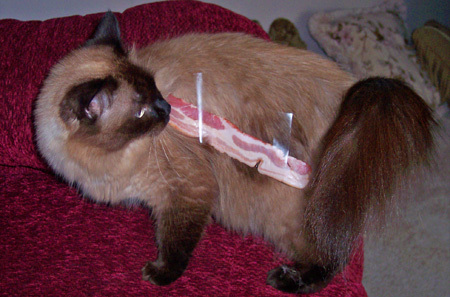 So, anyway, here is a picture of bacon taped to a cat. When this column is published, young journalists will once again call me a cantankerous old fud and allege that I am irresponsibly criticizing a brave new world I don’t really understand. Mostly, they’ll contend I am being shallow and superficial and shabby with the facts. I’m pretty sure they will do this without any sense of irony.